2000 was the year a global civil society movement — led by Africa — told the world that the global HIV treatment disparity would no longer be tolerated. At the start of the century, very few people in sub-Saharan Africa were on effective ART regimens, either via private care (for those who could afford it) or through small pilot projects. In 2001, the number of people on HIV treatment was approximately 27,000 — less than 1% of the 4.4 million adults and children with HIV in immediate need for treatment (within 2 years of dying from AIDS without ART). Less than fifteen years later, approximately 41% [38–46%] of all Africans living with HIV have been placed onto treatment, primarily via the public sector. Providing this degree of access took a global public effort of health and community actors of African civil society, people living with HIV, funders, researchers, national and international non-governmental organisations, clinicians, nurses and community healthcare workers, and public health officials. South Africa’s public sector ART programme — today the largest in the world — would not have developed if South African civil society had not mobilised behind the constitutional commitment guaranteeing the right to health. Two organisations led the way in South Africa, a small legal non-governmental organisation, the AIDS Law Project (ALP) and the Treatment Action Campaign (TAC). TAC was launched with an action on December 10th, 1998, calling on the government to plan programmes to provide free treatment to prevent mother-to-child transmission (MTCT) of HIV as well as a comprehensive treatment plan for all people living with HIV/AIDS. The activists also targeted one of the greatest obstacles to treatment — the prices charged for medications, particularly antiretrovirals, by the global pharmaceutical companies, which were far beyond what resource-constrained countries could afford to pay. To roll out pMTCT and treatment programmes, patent regimes had to change, and health programmes would need access to low cost generics. A new economic model of lower cost, high volume, quality treatment access needed to be created. The World AIDS Conference held in Durban, South Africa, July 2000, provided a forum to bring the demands of African AIDS activists for affordable treatment to the rest of the world. After a symposium making the case for providing antiretroviral treatment for the millions of people living with HIV in Africa, TAC led first the Global March for Access to Treatment with more than 5,000 people marching through the streets to the opening of the conference. It was a watershed moment — and the launch of a global advocacy movement that is now connected globally and responds to access issues whether in North America, sub-Saharan Africa, Eastern Europe or India. However, it would take more than marches to get access to more affordable treatment. Taking advantage of the right to health enshrined in the country’s new constitution, ALP and TAC fought and won several battles in court to get pMTCT and treatment programmes put into place. Just in time for the launch of the treatment programme in 2004, access to low cost generic antiretroviral medications became a real possibility in South Africa, a hard-fought innovation argued in the courts of South Africa, with global implications for the HIV response. TAC’s model emphasized activism demanding government accountability rather than the direct provision of services. Elsewhere in Africa, networks of people living with HIV and civil society developed different strategies to expedite access to treatment and care in their own countries. For instance, The AIDS Service Organisation (TASO) in Uganda began as a small support group of people living with HIV in the 1980’s. After the year 2000, however, they evolved to become the largest indigenous NGO providing HIV/AIDS services in Uganda and Africa. They integrated treatment with their prevention activities, to help build an integrated public health response. TASO established centres and home-based outreach programmes offering comprehensive HIV services, including a basic and preventive package of care, with HIV testing and counselling, management of opportunistic infections, and nutritional supplementation. TASO also engaged in capacity building, advocacy, and educational support in collaboration with public health institutions and academic centres. From 2002 onward, TASO’s centres began to offer ART — and these services increased dramatically once funding from PEPFAR and the Global Fund became available. Over the last fifteen years, national networks of people living with HIV and activist organisations have emerged all across the continent and have each adopted their own mix of these advocacy and service models. What unifies them, however, is the belief that people living with HIV must be meaningfully engaged in decisions about the development of health and social services that affect them. The integration of communities and people affected with the disease has greatly expanded the reach of the public health approach in Africa and is a major contribution to the Global Health Response. African communities have innovated in activism, delivery models and the involvement of those affected in all stages of the response. Creative solutions will be necessary in order to maintain a strong HIV civil society needed to demand a sustained HIV response. Behind the current treatment numbers, there was a decade of key steps and innovations to create the largest global treatment programs in Africa. In August 2003, the South African National Department of Health (NDOH) drafted a plan to scale up access to ART through the public sector. In 2003, out of a population of around 45 million, 5.3 million South Africans were estimated to be HIV-positive. The need was for a treatment program reaching millions more than in any other country of the world. Life expectancy had fallen dramatically — reaching a nadir of 53.9 years in 2005. Modelling studies suggested that in the absence of treatment, it would fall even further — to 37 years for women and 38 years for men by 2010 — a decline of more than 50% within a decade. Despite considerable delays, once political leadership got behind the new National Strategic Plan, the rate of scale-up has been unprecedented, with close to 3.1 million adults and children (2,912,000 Adults and 167,000 children) on treatment by December 2014 and has a goal of putting 4.6 million on treatment by the end of 2016. 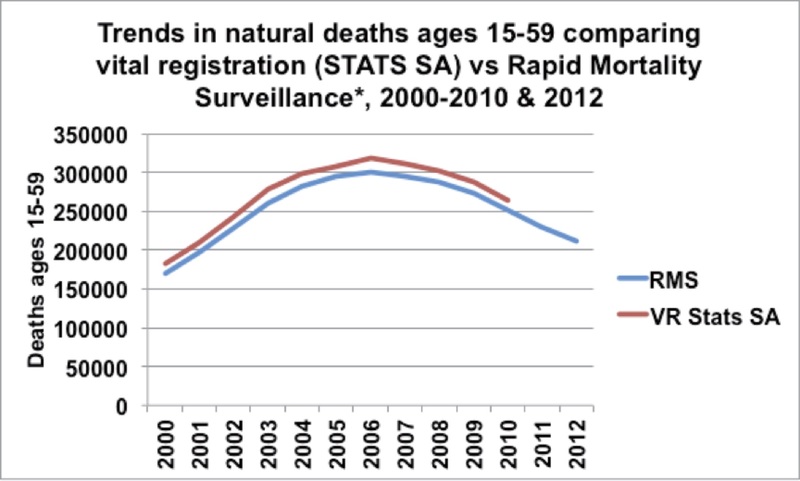 Consequently, all-cause mortality rates among South Africans taking ART for more than two years have fallen to levels equal to or below those registered in comparable North American cohorts., The treatment programs has been implemented at scale and with quality. Despite initial delays scaling up in South Africa, support from PEPFAR and the Global Fund helped develop crucial expertise at delivering and supporting high quality ART services. Once there was engagement from the government, and new leadership in the department of health, South Africa’s turnaround was swift. The health department commissioned an independent review of the TB and HIV programmes’ progress and shortfalls (see Data for Decisions, page TK). Taking on board the review’s recommendations, the country increased its spending on health so that the HIV response would become largely self-funded. (The large majority of the resources for the South African treatment program have however always been domestic.) The Department of Health revised its procurement system and achieved substantial reductions in the cost of ARVs. Today, the price South Africa pays per unit for the generic first-line ART regimen is less than 1 per cent of the cost charged for the brand name drug in the industrialised countries. The country also launched testing campaigns that led to a dramatic increase in the number of people who know their current HIV status. Most critically, the department of health adopted a public health approach to the HIV response leading to a dramatic increase in the number of sites offering HIV/AIDS treatment care and support services. ART is now available at virtually every health facility in the country. This was also capacitated by changes in legislation and training programmes so that primary care nurses would now initiate and manage people on ART. The government has also facilitated the use of data to monitor programme effectiveness — including encouraging clinic staff to use their own data to improve the quality of the services they deliver. Consequently, there has been a dramatic increase in the number of people on treatment so that South Africa now boasts the largest treatment programme in the world. This has been reflected in a steady drop in all-cause mortality in the country, most likely due to reductions in AIDS mortality. To a large degree, access to treatment has improved all across sub-Saharan Africa whenever these lessons and innovations are being employed. However, certain regional and programmatic challenges remain. Even within South Africa, access to ART is much better in some provinces and municipalities than others — and access is particularly uneven in the rural areas. Maintaining a steady supply of ARVs at the health facilities has at times been challenging — although the government now requires health facilities to order their antiretrovirals directly from the manufacturer, timely placement of orders remains inconsistent. There is much unfinished business in achieving universal access to treatment in Africa, particularly in some key countries. Elsewhere on the continent, there is still low coverage of ART in a number of high burden countries such as Nigeria, with 23% (21-26% for adults) and the Democratic Republic of Congo, with 24% (21-26% for adults) on ART. Both countries, however, have recently commissioned epidemiological and programme reviews to identify strategies to increase coverage and the impact of programme interventions., Inadequate healthcare infrastructure and human resources for health still limit the response in some settings, while civil unrest and lack of political will remain impediments to mounting an effective HIV response in others. Not every country has developed effective procurement and delivery mechanisms in order to maintain a consistent supply of affordable ARVs and commodities. Funding a sustained HIV response will remain a growing problem for many sub-Saharan African countries. While South Africa showed that it can largely support its HIV programmes with national funding, international donor support will need to increase for many of the poorer countries in the region to reach goals for universal access. UNAIDS. How AIDS Changed Everything. MDG 6. 15 Years, 15 Lessons of Hope From the AIDS Response. Geneva, 2015. Treatment Action Campaign. Fighting for our lives: The history of the Treatment Action Campaign 1998-2010. Cape Town 2010. Treatment Action Campaign. Competition Commission Settlement Agreements Secure Access to Affordable Life-Saving Antiretroviral Medicines. TAC Newsletter – 10 December 2003. http://www.tac.org.za/newsletter/2003/ns10_12_2003.htm. Igulot P, Nanongo D, Odongo D. Accelerated Response to HIV and AIDS Through Private-public Capacity Building Partnerships; The Experience of TASO Uganda.. 2008, HIV/AIDS Implementers’ Meeting, Kampala. Msemburi W, Pillay-van Wyk V, Dorrington RE, Neethling I, Nannan N, Groenewald P, Laubscher R, Joubert J, Matzopoulos R, Nicol E, Notilana B, Prinsloo M, Sithole N, Somdyala N and Bradshaw D. Second national burden of disease study for South Africa: Cause-of-death profile for South Africa, 1997–2010. Cape Town: South African Medical Research Council, 2014. ISBN: 978-1-920618-34-6. UNAIDS. UNAIDS. How AIDS Changed Everything. MDG 6. 15 Years, 15 Lessons of Hope From the AIDS Response. Geneva, 2015. Binagwaho A, Nutt CT, Mugwaneza P, Wagner CM, Nsanzimana S (2014) Convergence of Mortality Rates among Patients on Antiretroviral Therapy in South Africa and North America. PLoS Med 11(9): e1001719. doi:10.1371/journal.pmed.1001719. Boulle A, Schomaker M, May MT, Hogg RS, Shepherd BE, et al. (2014) Mortality in patients with HIV-1 infection starting antiretroviral therapy in South Africa, Europe or North America: a collaborative analysis of prospective studies. PLoS Med 11: e1001718. Harries AD, Libamba E, Schouten EJ, Mwansambo A, Salaniponi FM, Mpazanje R. Expanding antiretroviral therapy in Malawi: drawing on the country’s experience with tuberculosis. BMJ. 2004 Nov 13;329(7475):1163-6. Kasper T, Coetzee D, Louise F, Boulle A, Hilderbrand K. Demystifying antiretroviral therapy in resource-poor settings. Essential Drugs Monitor 32, 2003.
 WHO and South African Department of Health. Joint Review of the HIV, TB and PMTCT Programmes in South Africa – April 2014. Bekker LG, Venter F, Cohen K, Goemare E, Van Cutsem G, Boulle A, Wood R. Provision of antiretroviral therapy in South Africa: the nuts and bolts. Antivir Ther. 2014;19 Suppl 3:105-16. doi: 10.3851/IMP2905. Epub 2014 Oct 13. Bekker LG, Venter F, Cohen K, Goemare E, Van Cutsem G, Boulle A, Wood R. Provision of antiretroviral therapy in South Africa: the nuts and bolts. Antivir Ther. 2014;19 Suppl 3:105-16. doi: 10.3851/IMP2905. Epub 2014 Oct 13..
 National Agency for the Control of AIDS (NACA). Nigeria, National HIV/AIDS Epidemiology and Impact Analysis. 2014. [Mise a Jour de Profile épidémiologique R. D. Congo. Mutimura E, Addison D, Anastos K et al.Trends in and correlates of CD4+ cell count at antiretroviral therapy initiation after changes in national ART guidelines in Rwanda. AIDS. 2015 January 2; 29(1): 67–76. doi:10.1097/QAD.0000000000000520. IeDEA-WHO Collaboration. Global analysis of retention in care in initiation HIV care and treatment programmes in the IeDEA regions. Mutimura E, Addison D, Anastos K et al.Trends in and correlates of CD4+ cell count at antiretroviral therapy initiation after changes in national ART guidelines in Rwanda. AIDS. 2015 January 2; 29(1): 67–76. doi:10.1097/QAD.0000000000000520. Duncombe C, Rosenblum S, Hellmann N, Holmes C, Wilkinson L, Biot M, Bygrave H, Hoos D, Garnett G. Reframing HIV care: putting people at the centre of antiretroviral delivery. Trop Med Int Health. 2015 Apr;20(4):430-47. Bekker LG, Venter F, Cohen K, Goemare E, Van Cutsem G, Boulle A, Wood R. Provision of antiretroviral therapy in South Africa: the nuts and bolts. Antivir Ther. 2014;19 Suppl 3:105-16. doi: 10.3851/IMP2905. Epub 2014 Oct 13..